During his tenure as President CEO of ICANN, Fadi Chehadé became involved in the successful roll-out of the TLD Registry program. The end result: hundreds of new gTLDs were introduced to the world, creating an entirely new dynamic in the domain market. ICANN now holds onto millions of dollars in cash reserves, thanks to the new gTLD program’s proceeds. 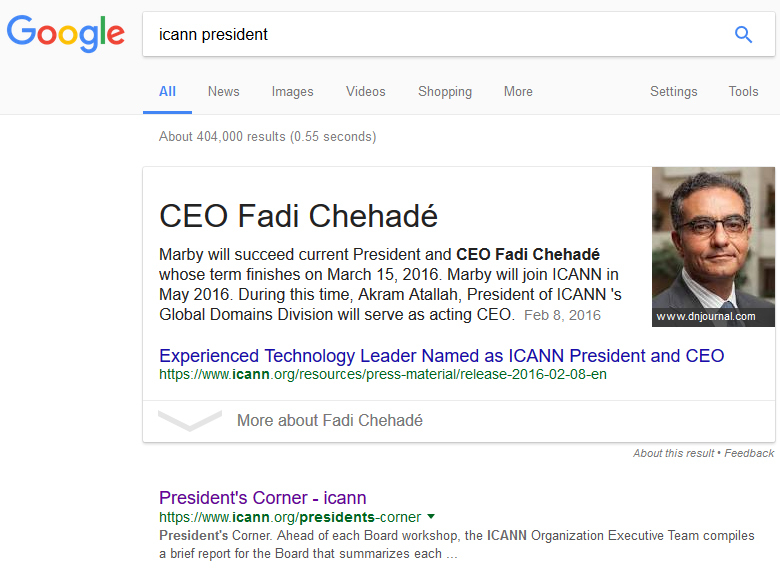 While Fadi Chehadé is no longer the ICANN CEO, his online legacy lives on. Google snippets are not always up to date, and there’s a reporting process in place to fix this. Anyone at ICANN up to the task?